I should start by saying that I feel very lucky that my partner knows me as well as he does. I know this because his present to me was a private tour around Rome. The day of the tour didn’t start well, with rain threatening, but it being our last full day in Rome we couldn’t change the date so decided to take the risk. Thus we ended up running through the streets, avoiding (most of the) puddles and umbrella salesmen (who were legion) and arriving at the Baths of Caracalla only 5 minutes late. Our guide, Marisa, met us there, and after the introductions we got started on our exploration of everyday ancient Rome. One of the things that had appealed to us about the tour guide was the option of a special tour entitled ‘Daily Life in Ancient Rome’. As my previous post about Ostia may have hinted, I am most fascinated by the traces of everyday life left by people going about their lives, from local bath houses to apartment buildings and bars. Yes, the basilicas would have been grand and imposing, but what about the little stalls in the shadows of the columns? The lawyers shilling for work from all comers, and the teachers trying to drum grammar into the heads of distracted children over the bustle of the crowds? If you look closely at the steps of the Basilica Julia in the Forum, you can see circles carved into the marble, the remnants of game boards made thousands of years ago. Perhaps someone had been bored, while waiting for an appointment, or while watching a speech from the rostrum? We’ll never know I suppose, but that’s why we write stories. 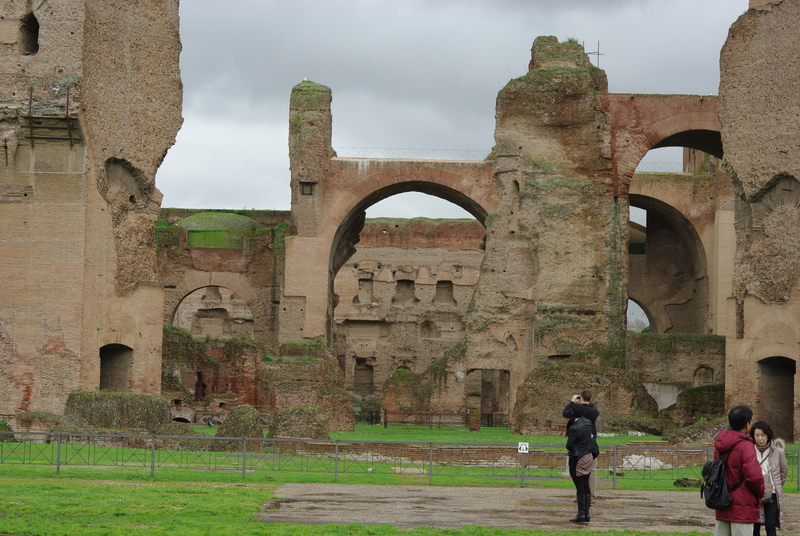 The Baths of Caracalla are massive, and were apparently not even the largest complex in ancient Rome. The whole site would have covered 25 hectares, and the closest approximation I can imagine would be a massive luxury gym that was open for all members of the public, the sort of building I can’t really imagine existing now. The fact that anyone could go there for a low fee, and sometimes for free, was one of the things I liked about it, but it’s dimensions and the beauty of the remaining art and the construction are also amazing. 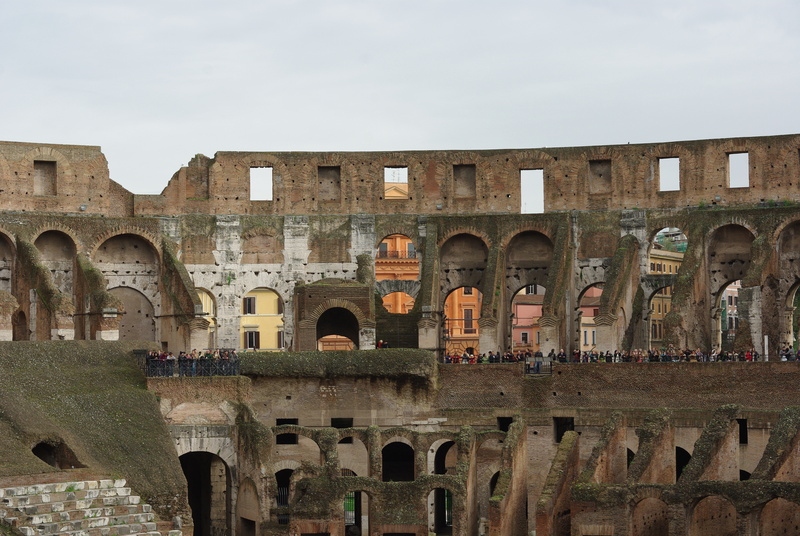 Much of the roof has now collapsed, leaving arches and towering walls where domes and mosaic laden ceilings were once suspended over glittering mosaics and bathing pools brimming with the multitudes of Rome. As we walked through the halls and corridors, Marisa explained what it would have been like to visit, and about the engineering and labour that went on behind the scenes to keep the caldariums hot and the frigidariums chilly. From the Baths we headed to the Caelian Hill, which I hadn’t even really noticed before. 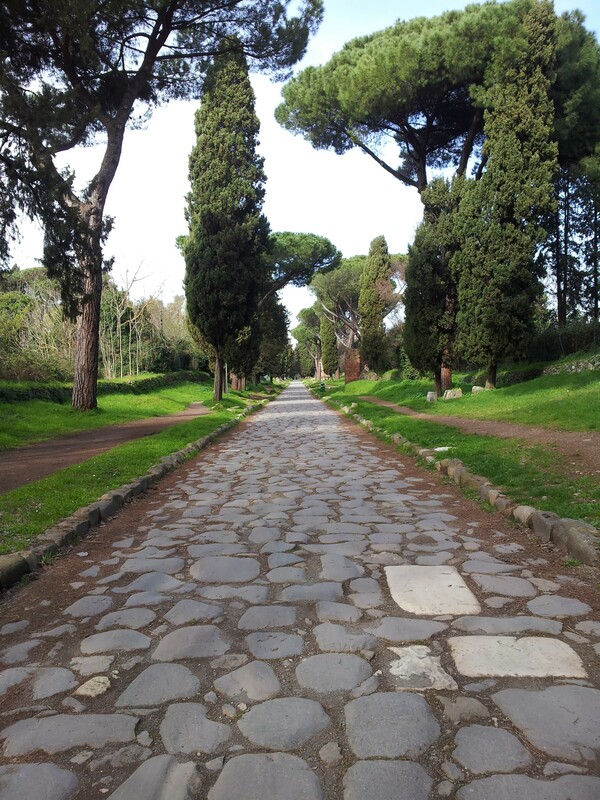 It overlooks the Circus Maximus, to the south of the Capitoline, and is dominated by churches. We went into one of the churches, under which lies part of an ancient neighbourhood. 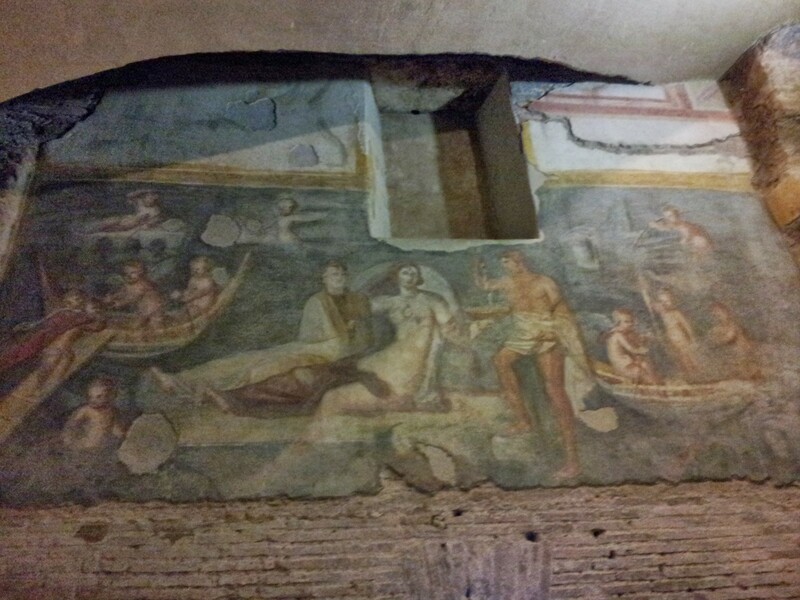 We entered a small domus, with paintings still intact, and proceeded to explore. 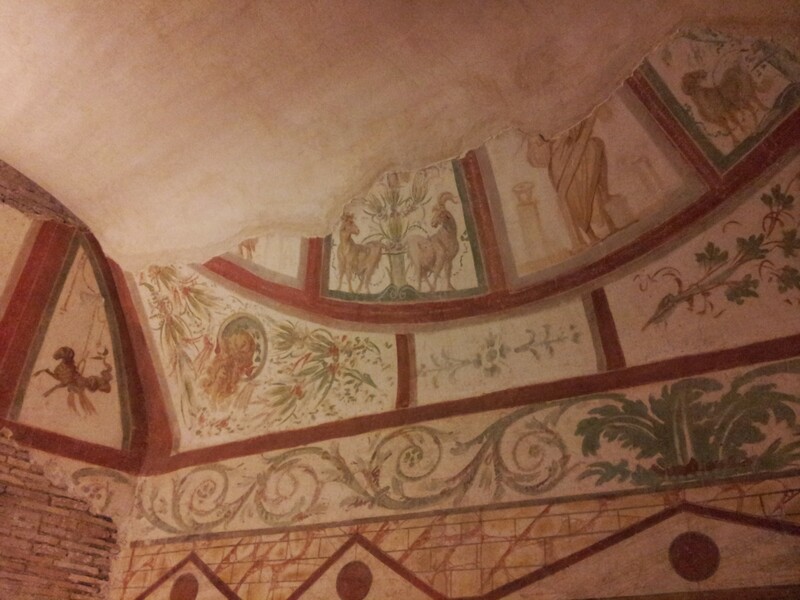 Connecting rooms also featured paintings, figures and beasts, some of the figures censored by ancient monks. 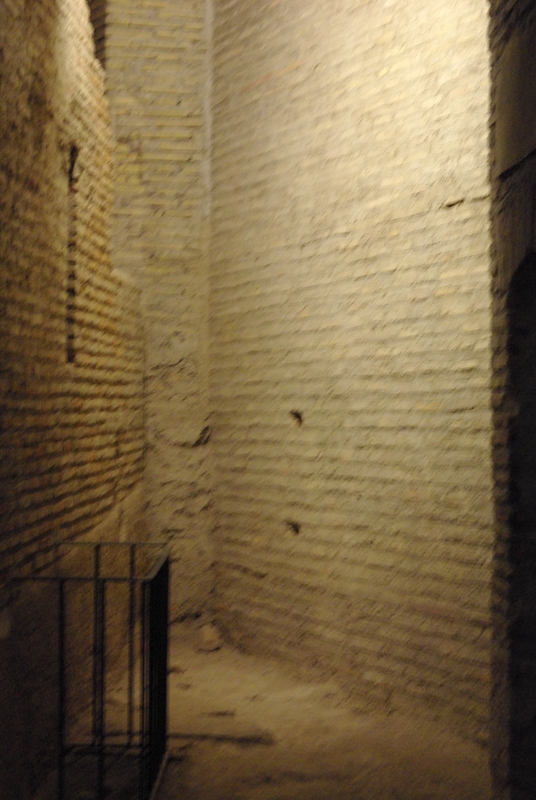 Then we were out on an ancient street, descending to another level, softly lit but for the dim corners and deep wells. The houses and streets had been preserved as the foundations of the church, as with many other sites around the city. These particular ruins were of interest because of a theory about 2 skeletons that had been discovered there. 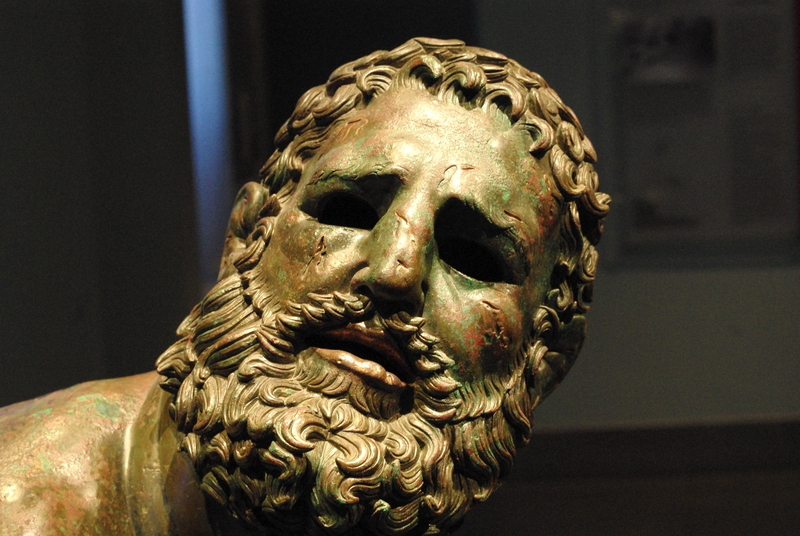 They were found buried in what had been a garden, which was very strange for ancient Rome, where everyone was cremated or buried outside the city walls. It had been assumed by Christians that the bodies were those of two martyrs who were known to have been buried in a garden in Rome. 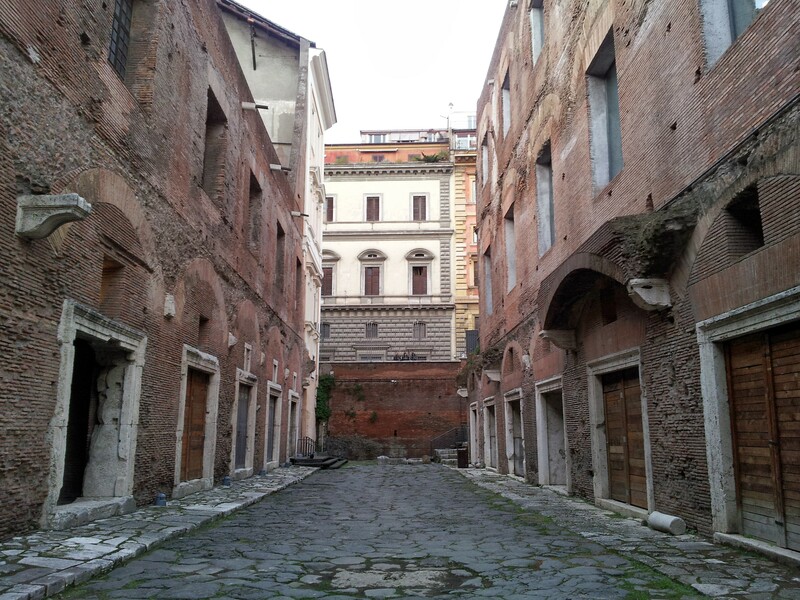 Whether or not the skeletons really were John and Paul (though not that John and Paul), it was wonderful to be able to walk through ancient streets and ancient houses, only a few metres below the living city. The final stop was the museum that accompanied the houses, and then we were out and walking together to the Colosseum, where we sadly farewelled Marisa and went off the have lunch. I thoroughly recommend her tours, to anyone who is considering visiting Rome and it’s environs. 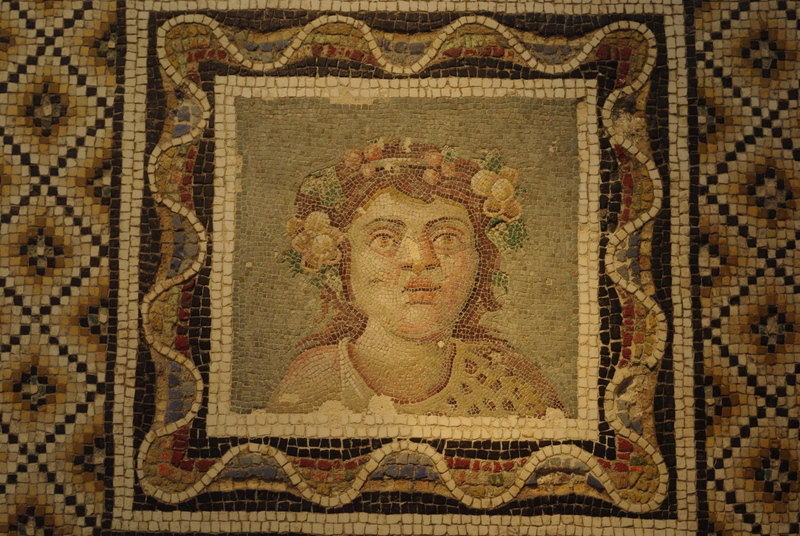 She was able to answer all of our questions and give us endless reams of information and a sense of what it is like to live and breath Rome, both ancient and modern. If I ever visit again, and I reeeally hope I will, I’m definitely going to look her up again. Well, after following her recommendation of an early morning visit to the Pantheon. After lunch we joined the queues for the Colosseum, eventually making our way in and then spending about an hour wandering around the huge ruins. It sometimes doesn’t feel like a ruin, with so much still intact and the scale still discernible, if diminished. Sadly the lower floors were closed due to flooding, and the upper floors were closed for an unspecified reason, but we were able to join the crowds for the full circumference, admiring the spectacle around us, and exhibits of the toothpicks, plum pits and knuckle bones that had been left behind by visitors thousands of years ago. The last attraction was the Museum of the Imperial Forums, the highlight of which was yet more ancient streets, this time flanked by mostly intact rooms that once held shops, that tower over the street in multiple stories. From the top stories we had a very good view over the Forum as dusk was approaching, and after a final stroll along the streets, imagining the area in the midst of ancient bustle, we went out onto the street. Dinner that night was at the Tavern of the Imperial Forum, just around the corner from the museum, which not only featured an ancient Roman wall along one side of the room, but excellent food and wine. If there was only one thing I would take away from the tour with Marisa, it would be an ability to recognise ancient Roman brickwork. Perhaps a specialist skills, but I hope to put it to use. 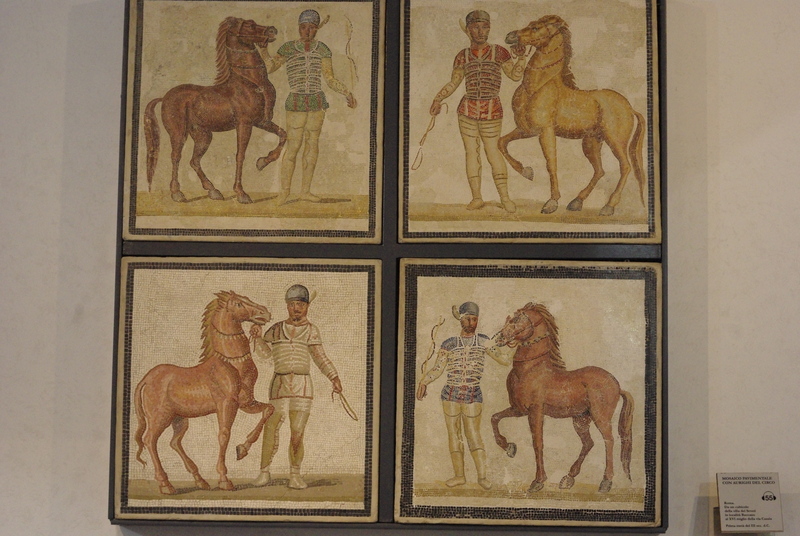 The next day was the last one, spent packing and then whiling away the last of our time at the Palazzo Museum, which contained the most astounding mosaics and wall paintings that I have ever seen. 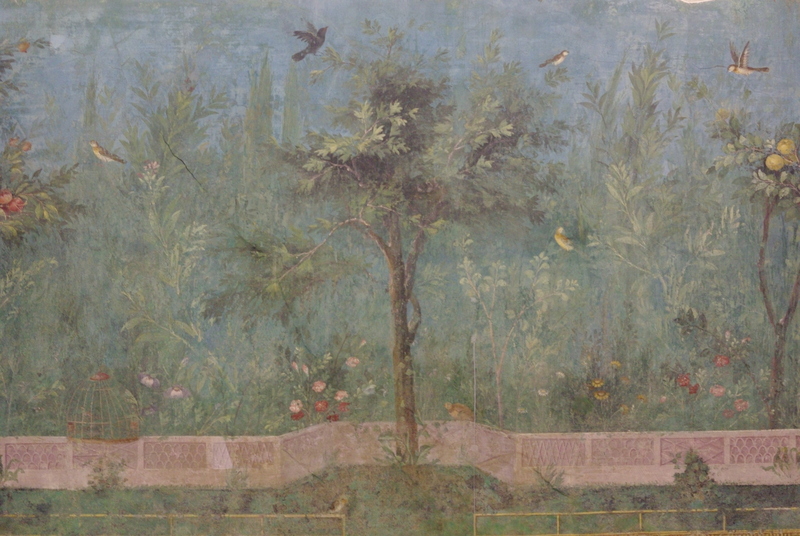 The triclineum of Livia was especially wonderful, featuring a riot of trees and shrubs, housing birds that seemed as though they would fly off at any moment. The room was lit in such a way that every hour it would cycle through the changes of light in a day, and I wish I could have experienced all of them. We also found remnants from the ships of Nemi, rudder clasps, railings and a face of Medusa in bronze, and some extremely fine sculptures. Next time I visit I hope to go to the museum again to give the items the time they deserve. Then we went to the airport, said goodbye to the Italian sun and in a few hours stepped out into the wet chill of a Swedish afternoon, memories of warmth and sunlight on ancient stones still clear in our minds.